Stereo matching is one of the most widely used algorithms in real-time image processing applications such as positioning systems for mobile robots, three-dimensional building mapping and both recognition, detection and three-dimensional reconstruction of objects. In area-based algorithms, the similarity between one pixel of the left image and one pixel of the right image is measured using a correlation index computed on vicinities of these pixels called correlation windows. To preserve edges, small windows need to be used. On the other hand, for homogeneous areas, large windows are required. Due to only local information is used, matching between primitives is difficult. 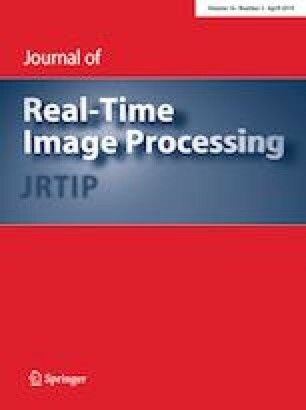 In this article, FPGA implementing of an efficient similarity-based adaptive window algorithm for dense disparity maps estimation in real-time is described. To evaluate the proposed algorithm's performance, the developed FPGA architecture was simulated via ModelSim-Altera 6.6c using different synthetic stereo pairs and different sizes for correlation window. In addition, the FPGA architecture was implemented in an FPGA Cyclone IIEP2C35F672C6 embedded in an Altera development board DE2. The disparity maps are computed at a rate of 76 frames per second for stereo pairs of 1280 \(\times\) 1024 pixel resolution and a maximum expected disparity equal to 15. The developed FPGA architecture offers better results with respect to most of the real-time area-based stereo matching algorithms reported in the literature, allows increasing the processing speed up to 93,061,120 pixels per second and enables it to be implemented in the majority of the medium gamma FPGA devices. Adaptive window Stereo matching Disparity map FPGA.